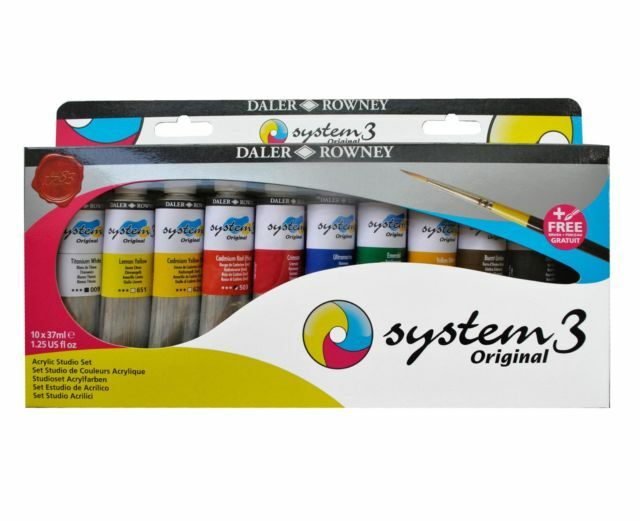 This Daler Rowney acrylic paint set contains 10 x 37ml tubes of System 3 Original acrylic paint. System 3 Acrylics are ideal for the amateur and professional painter requiring excellent quality colour in a larger sized tube. Only high quality pigments are used in the manufacture of Daler Rowney System 3 Acrylics, with a greater loading than other colours in their class. This has made it the best selling acrylic range in the UK. This set contains ten colours of 37ml tubes and a free acrylic painting brush.